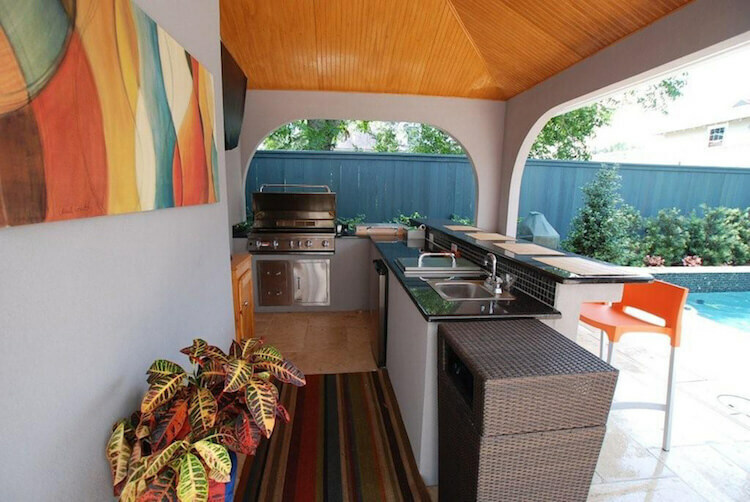 We work with you to create a complete outdoor cooking space that works with your lifestyle and home. 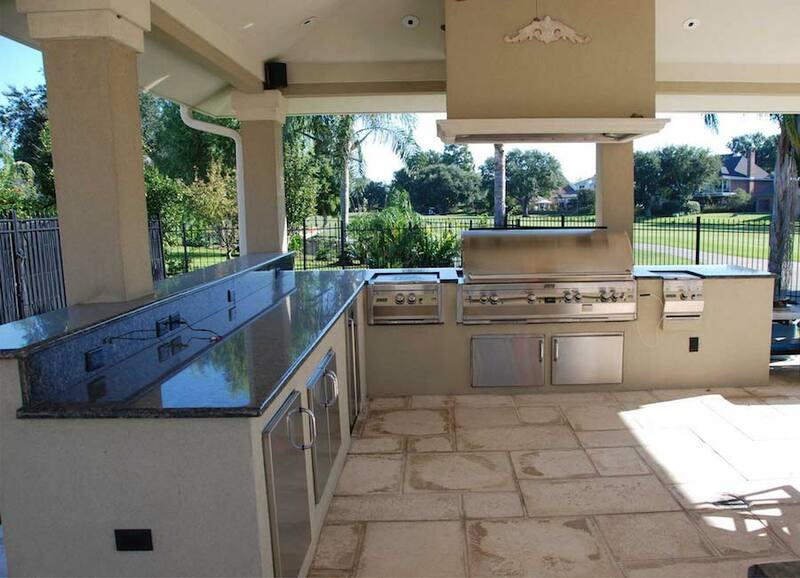 From design to installation we’re with you every step of the way to make sure you get the exceptional outdoor kitchen you’re looking for. 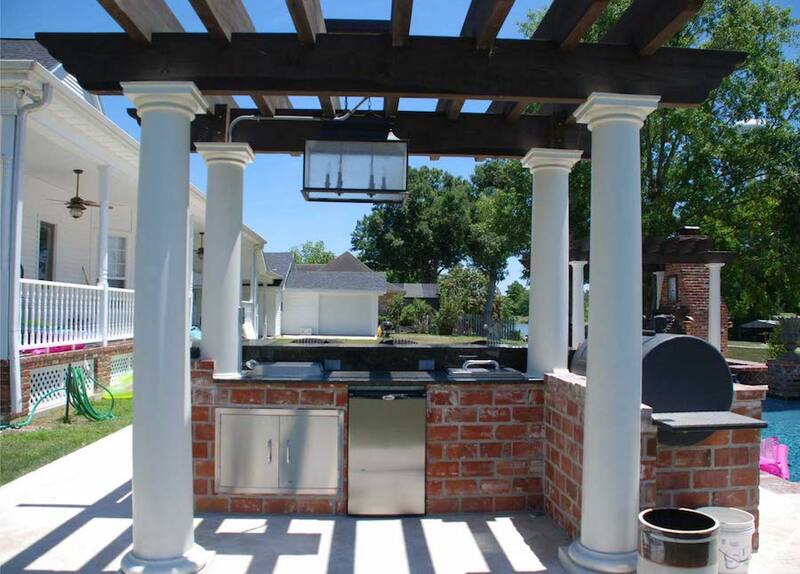 Our outdoor kitchen design is more than just grills and smokers, we also can include refrigerators, sinks, wine coolers, warmers and more from the finest brands, Fire Magic, DCS, Kamado Jo, Bull and Lynx. Let’s chat about your perfect backyard lifestyle. Stop by and visit our new store at 7211 Regent Street in Lakeview near the New Orleans marinas. 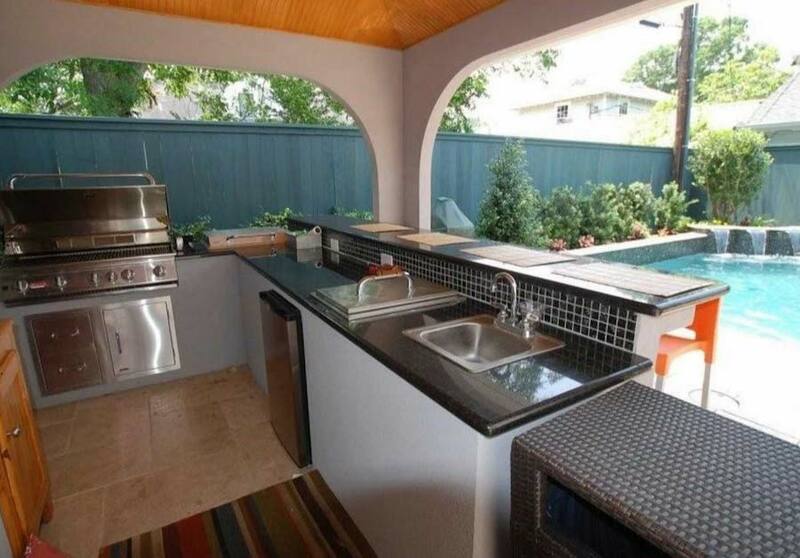 Do I need to be a custom pool client to get a custom outdoor living area? 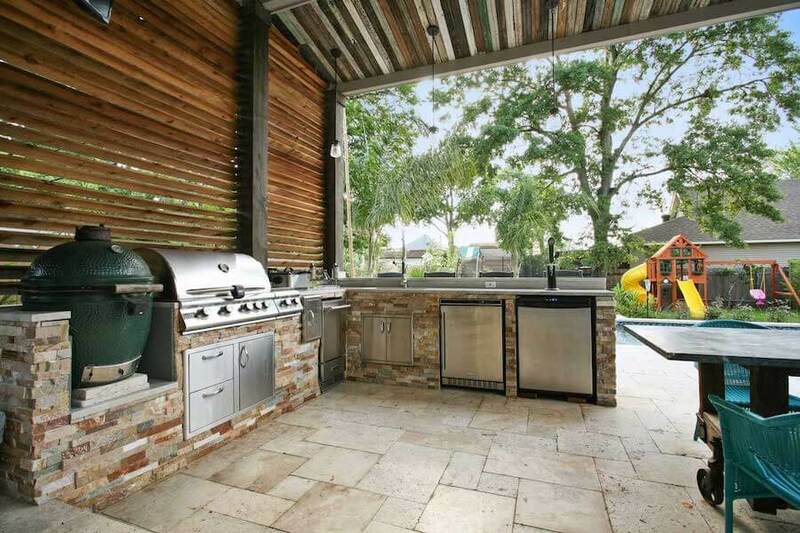 Is an outdoor kitchen safe? Yes! All of our outdoor spaces are created individually to be the right fit for your space aesthetically and for safety. Our kitchens are made with metal studs, lowering the chance of fire. 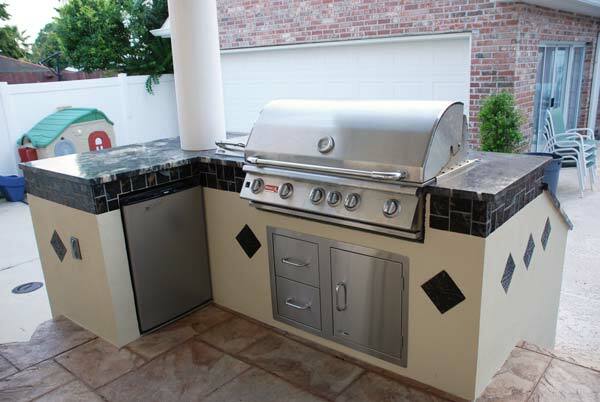 What grills do you recommend? We carry our favorite, Kamado Joe ceramic grills, because we believe they are the best quality. Their egg-shaped design adds a unique touch while you grill, smoke and sear. It’s our grill of choice for our favorite grilling recipes, from Sriracha Short Rib Snacks, to Grilled Shrimp Skewers, and Grilled Okra with Green Chile Aïoli. We always start with a one on one consultation to see your backyard and understand your wants and needs. Then we take measurements of your space to ensure the perfect fit. After measurements we create a 3D rendering of the proposed backyard for you to approve. When we’ve mapped out the perfect space for you, then we can work on getting the correct permits to complete the work. Before construction starts we layout the space to visualize how the completed work will look. When the project is laid out then we can complete construction. We won’t be in your hair for long! From the design consultation to construction, we allow a 3 week total turnaround for completing outdoor spaces without a pool or spa. Every backyard is different. 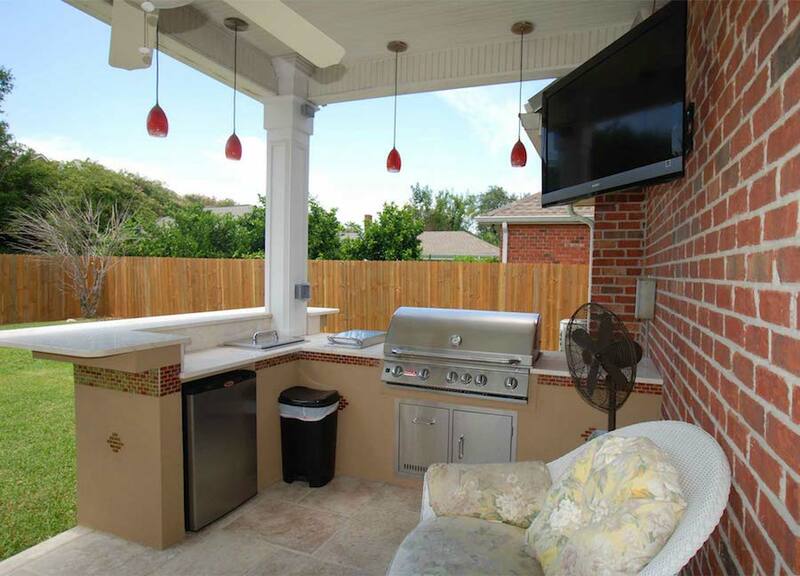 Depending on your wants and needs, an outdoor living space can cost anywhere between 10-50K for the entire process. We are always honest with our customers about the total cost from the get-go. Time to get cooking! Are you ready?